Fear has a new home. He's back! From the filmmakers that brought you Chucky comes the terrifying return of the pint-sized doll possessed by the spirit of a notorious serial killer. When a mysterious package arrives at the house of Nica (Fiona Dourif), she doesn't give it much thought. However, after her mother's mysterious death, Nica begins to suspect that the talking, red-haired doll her visiting niece has been playing with may be the key to the ensuing bloodshed and chaos. The return of America's favorite toy, voiced again by Brad Dourif, is unrated and full of more blood-splattered thrills and chills. 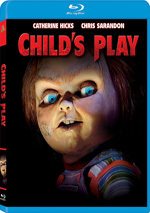 After Child’s Play became a success in 1988, its first two sequels hit movie screens in rapid succession: Child’s Play 2 arrived in 1990 and Child’s Play 3 came out in 1991. After that, however, the franchise’s pace slowed. Fans needed to wait seven years for Film Four, 1998’s Bride of Chucky, and then another six years elapsed before 2004’s Seed of Chucky appeared. I figured the series died there, but one should never assume the end of a horror franchise, as 2013’s Curse of Chucky proves. Wheelchair-bound Nica (Fiona Dourif) lives with her mother Sarah (Chantal Quesnelle). One day they receive a package with a Chucky doll inside of it. With no indication of who sent it, Sarah drops the doll in the trash. As anyone who saw the prior movies can attest, this falls into the “bad move” category, as Sarah winds up dead due to an apparent suicide, though the sight of Chucky in the house lets fans know the truth may differ. Sister Barb (Danielle Bisutti) comes with her family to care for the distraught Nica, and Barb’s young daughter Alice (Summer H. Howell) discovers Chucky. Again – not good. Bad things start to add up from there, and the situation inside the house grows grim as Chucky picks off the inhabitants. Although the first Child’s Play offered a fairly straightforward horror flick, the sequels tended more toward camp and comedy. Curse retreats from that template and gives us an experience with a more serious feel. Indeed, Curse often goes for a gothic tone. Writer/director Don Mancini cites the 1930s classic The Old Dark House as an influence, and that becomes clear, as most of the action remains confined to one home. Some of that stemmed from budgetary issues; as Mancini mentions in the commentary, Curse didn’t boast substantial financial resources, so the use of one dominant location occurred partly to save money. Whether related to creative choices or cash concerns, the structure does give Curse a unique feel for the franchise – but is it a fruitful one? Ehh, not really, as we’re stuck with dull characters and a slow pace too much of the time. Normally I appreciate it when a movie franchise alters its standard template, but in the case of Curse, I just don’t think it works. The basic concept of the “killer doll” is so goofy that it suits a comedic treatment, and a shift toward a more serious, dark tone doesn’t really fit. Or maybe it’s just the pacing and dull characters that become the problem. Curse eschews rapid-fire antics and prefers a slow boil, so it takes quite a while before it goes anywhere. Not that we care when it gets to its destination, as the combination of flat characters and non-existent drama keep us uninvolved. In addition, the audience remains so far ahead of the movie’s characters that any potential suspense fails to appear. Granted, we know that Chucky will come to life and kill, but the film could’ve left this a “mystery” for a while and lead us to wonder if Chucky’s in action or there’s someone else. Since we see Chucky do his thing, even this basic piece of tension evaporates. I will say that Curse gets better in its final act, mostly because it more fully embraces the silly, anarchic spirit that best suits the franchise. If you’re not asleep after the first 60 minutes, you may find the finale to entertain – especially via a few fun cameos at the very end. Unfortunately, it’s a tough ride to get to that last 30 minutes or so. I can’t call Curse of Chucky a terrible film, but it’s too dull too much of the time to become anything better than meh. Footnote: hang out through the end of the credits to find a good bonus clip. Curse of Chucky appears in an aspect ratio of approximately 1.78:1 on this Blu-Ray Disc. The transfer consistently seemed satisfying. Sharpness was usually very good. A few wide shots looked a smidgen soft, but not to any serious degree. The vast majority of the film appeared well-defined and concise. No problems with jagged edges or shimmering occurred, and edge enhancement remained absent. In terms of print issues, no concerns materialized. Like most modern horror movies, Curse went with a stylized palette. Much of the flick stayed with a pretty desaturated set of tones; a few brighter colors popped up in some moments but the image usually stayed chilly. Within those constraints, the hues were appropriate and well-rendered. Blacks seemed dark and tight, while shadows showed nice delineation and didn’t appear too dense. Overall, this was a positive presentation. Similar thoughts greeted the fairly good DTS-HD MA 5.1 soundtrack of Curse. The soundfield mostly delivered a mix heavy on atmosphere. Ominous noises cropped up in the side and rear speakers, and scare moments added to the track. Those elements created a nice sense of place and brought impact to the material. Audio quality satisfied. Speech sounded crisp and distinctive, and music appeared robust and full. Effects were accurate and dynamic. Low-end response showed good thump and richness. Nothing here dazzled, but the audio merited a “B”. When we look at the set’s extras, we discover two different versions of the film. We get an R-Rated Cut (1:34:43) and an Unrated Cut (1:36:41). What do you get from the added 118 seconds? I have no idea, as I only watched the longer version. Still, I wanted to mention that both editions appear. After this comes an audio commentary from writer/director Don Mancini, puppeteer Tony Gardner and actor Fiona Dourif. All three sit together for this running, screen-specific look at story/character areas, camerawork and visual design, sets and locations, influences, cast and performances, effects and bringing Chucky to life, music, and related areas. The participants deliver a strong discussion of the film. Mancini dominates, but the other two throw in useful notes as well. The chat moves at a nice pace and combines facts with humor to create an informative and enjoyable take on the movie. Three featurettes follow. Playing with Dolls: The Making of Curse of Chucky goes for 15 minutes, 34 seconds and includes comments from Mancini, Dourif, key makeup/special makeup effects artist Douglas Morrow, assistant special makeup effects Emerson Ziffle, stunt coordinator/stunt double Rick Skene, and actors Brad Dourif, Danielle Bisutti, Jennifer Tilly, Brennan Elliott, Maitland McConnell, Alex Vincent, A Martinez, and Summer Howell. They discuss the movie’s tone and story, thoughts about cast and crew, set design, makeup and effects, stunts, and general thoughts about the franchise. Some of the info about makeup proves interesting, but this mostly acts as a banal puff piece. Living Doll: Bringing Chucky to Life lasts eight minutes, 35 seconds and features Bisutti, McConnell, Elliott, Mancini, Gardner, Brad Dourif, Fiona Dourif, Chucky doll mechanical designer Peter Chevako, knitter Adelle Burda and stunt double Deborah Lee Carrington. We learn about all the elements required to convey Chucky on the screen. A good contrast to the fluffy “Dolls”, “Life” gives us a solid take on the subject matter. For the final featurette, we get Voodoo Doll: The Chucky Legacy. It fills seven minutes, eight seconds and provides info from Brad Dourif, Tilly, Vincent, Bisutti, Mancini, Martinez, Fiona Dourif, and Elliott. “Legacy” gives us a look back at the franchise. Nothing memorable occurs here, but it turns into a reasonably fun overview. Six Deleted Scenes occupy a total of six minutes, 17 seconds. Most of these seem pretty mundane, such as the one that shows Nica as she gets out of bed; it’s a passable character moment but not interesting. The rest have a little more life but not much, so don’t expect them to add material of interest. A Gag Reel occupies one minute, 27 seconds. Some of this offers the usual silliness and mistakes, but a few alternate lines appear as well. Those make it a bit more useful than most blooper collections. Finally, we locate some Storyboard Comparisons. With a total running time of 25 minutes, 19 seconds, these accompany four scenes: “Electrocution”, “The Attic”, “Ian’s Death” and “Nica vs. Chucky”. Mancini introduces all of them, and we then see the comparisons themselves; those show the movie in the upper left corner of the screen with the art in the lower right. I’m not a huge fan of storyboard presentations, but this one works pretty well. The disc opens with ads for Dead in Tombstone, Machete Kills, The Purge and Bates Motel. Previews adds clips for Mama, Silent House, The Unborn, The Strangers, My Soul to Take, The Fourth Kind and Dream House. No trailer for Curse appears here. A second disc provides a DVD copy of Curse. It also includes the commentary, the deleted scenes, the gag reel and “Playing with Dolls”. After almost a decade, everyone’s favorite homicidal doll returns for Curse of Chucky. Though it rebounds toward the end, the flick moves too slowly and with too little suspense too much of the time to become an engaging revival of the series. The Blu-ray brings us positive picture and audio as well as a decent collection of bonus materials. The movie seems mediocre, but the Blu-ray presents it well.